Tennessee Education Report | Still Spanking Students? Even as legislative efforts to limit the use of corporal punishment ramp up, some Tennessee school districts continue to incorporate physical violence against children into their discipline policies. The Elizabethton Board of Education approved first reading of a disciplinary policy last month that continues to allow corporal punishment in the school system. Final approval of the policy will be made at school board’s next meeting. Should Rep. Jason Powell’s legislation gain approval, using corporal punishment against children with disabilities will be prohibited. It’s not clear whether the trend of hitting students with disabilities at higher rates extends beyond middle Tennessee. It is clear that School Boards in many Tennessee districts still condone the use of physical violence as a means of disciplining children. 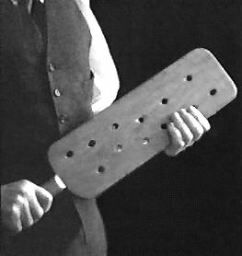 This entry was posted in Corporal Punishment and tagged Andy Spears, Corporal Punishment, Paddling Hurts, Paddling in Schools, Paddling Kids in Elizabethton, Paddling Students, Physical Violence Against Kids, School Boards and Paddling. Bookmark the permalink. I think more school districts should have corporal punishment. A repeated disobedient child can care less about the words of an authority figure; however, paddling is an instant response that children change behavior from. I’ve seen the difference in student behavior at the old MCS (now SCS) shift drastically since the removal of corporal punishment. Corporal punishment is not physical abuse. It is another method to redirect negative behavior.